Completed in 1901, the nine-bedroom stucco-clad Residence was designed by Henry Bacon, later renowned as the architect of the Lincoln Memorial in Washington D. C. The Residence incorporates several architectural styles: English Georgian, American Colonial Revival, and references to Italian villa architecture. The exterior bears generalized Colonial Revival details (general symmetry, dormers, and shutters), and the siting of the house on a ridge with splendid views from the porches and terraces is more likely drawn from Italian sources. The overall design must have been deeply appealing to French because it combined the form of his grandfather’s beloved Chester, NH, Colonial Revival house with nostalgic references to the architecture seen during his Italian travels. The Residence contains antique furnishings that were either family heirlooms or bought by the sculptor at local antique auctions. Some elements were reused or recycled from other structures. French was a proponent of “adaptive reuse,” and repurposed the original Warner farmhouse’s doors, molding, and fireplace surround. He installed silver-plated knobs and hinges rescued from a New York City townhouse under demolition. 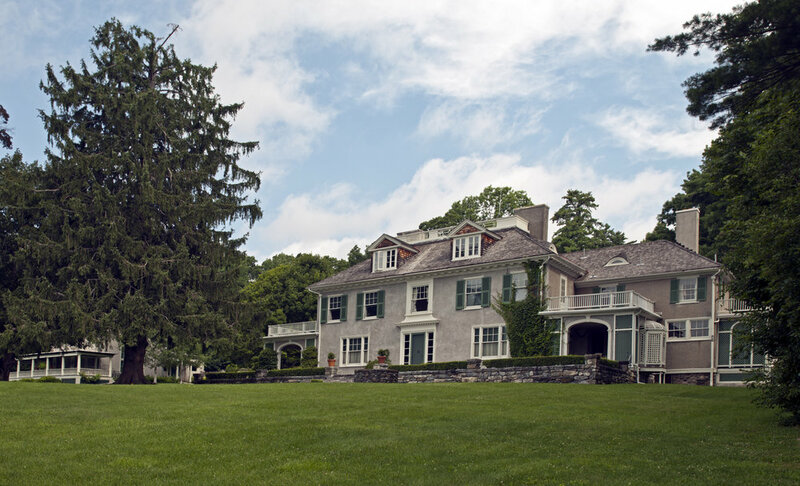 Although French’s daughter made changes in furnishings, decoration, and structure after Chesterwood passed to her ownership, the house is essentially the same as it was when it served as the family’s summer retreat. The second floor of the Residence is currently being rehabilitated in order to expand Chesterwood’s Artist-in-Residence program. The exterior of Residence was rehabilitated in 2015-16, and restoration work on the east breakfast porch has been completed.